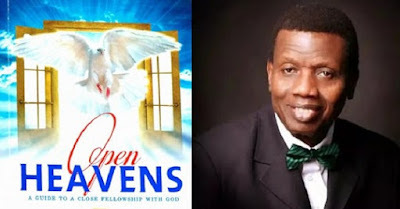 Open Heaven 2 January 2019: [Wednesday] Daily Devotional By Pastor E.A Adeboye – A child of Issachar? As we start another year, it is pertinent for us to have an understanding of the times we live in, in order for us to succeed. Open Heaven 2 January 2018 A child of Issachar? In order not to be deceived by different schemes being propagated by the devil in the world today, the elect of God by grace must have an understanding of the times they live in just like the children of Issachar. As the new-year beings, many prophecies, predictions and projections will be given by different types of characters. As a child of God with understanding, you must be very careful not to be receptive to them all. Anchor your expectations on the revealed truth in the Bible, and you will live a life of freedom and good success in this new year. May the Lord continually be with you in Jesus’ Name.